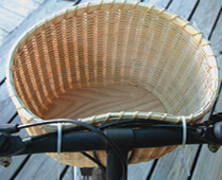 The Nantucket Bicycle Basket Kit is our first Nantucket-designed Basket. 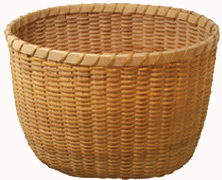 Be assured that even a Beginner weaver can weave this beautiful basket easily and successfully! We've designed it with a 6x9" slotted oak base, 1/2" flat reed spokes and chair cane for the weavers. No basket mold is needed. The basket attaches to your bike with cable ties (included in your kit). 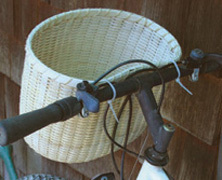 By the way, the shape is oval- so you don't have to use this as a bicycle basket if you don't want to. When you attach it to your bike, the rim is flexible enough to conform to the handle bars. (In our case, the basket becomes kidney-shaped at the top.) 9" wide, 11.5" long, 8" tall. A generous size! SKILLS LEARNED: Weaving with slotted wood bases, plain-weave continuous weaving, Cut and Tuck, rim lashing.